The next deed I will explore for Edward Marden is for land in Lyman. Lets see just what the deed adds to our knowledge of the family. 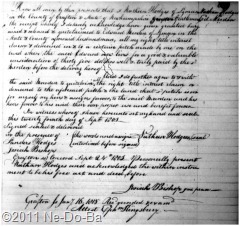 The deed is recorded 16-Jan-1815 (the same day the first two deeds are recorded!). What is a quitclaim deed? I am not completely sure so I Googled it. I found lots of really convoluted legalese but the following definition seem to express things in terms I can understand. A deed releasing a person’s interest in a property without stating the nature of the person’s interest or rights, and with no warranties of ownership. While a quitclaim deed neither warrants nor professes that the grantor’s claim is valid, it does prevent the grantor from later claiming they have an interest in the property. It appears Edward Marden is living on this land in Lyman. But I have yet to learn just how long he has been there and why Mr. Hodges would have any interest in the land. Quitclaim deeds are often used to convey inherited land from one heir to another, so it is important to learn more about Nathan Hodges. Could he somehow be related to Edward? My original search for Lyman history did not provide much information, so I decided to give it another try. A new search for Lyman history produced a book that I missed the first time around. It is Historical sketches of Lyman, New Hampshire by E.B. Hoskins, 1903 and found on archive.org. I was disappointed to find no mention of Edward Marden in the entire book. However, the book claims Hamilton Marden served in the Revolutionary War and is buried in the town. To the best of my knowledge, Hamilton is the name of a grandson. Perhaps the author made a field note that Hamilton Marden’s grandfather was a soldier, but when he prepared the actual manuscript for publishing it somehow got mixed up. Of course I am only speculating and perhaps there was an earlier man of the same name as Edward’s grandson. If so, he could be Edward’s father or brother and would be worth checking into a bit more. I do need to spend some time looking at this Hodges family to make sure they are not related to Edward in some way. I did not find any mention of a Barnes family or a White family in this Lyman history. The original grant for Lyman was based on settling 50 families in a certain period of time. If this was not accomplished on time the grant would become void. As the deadline came near, people already in town might offer land free to anyone that would come and settle. It could be that Nathan Hodges owned a number of lots and gave a lot to Edward for the purpose of settling there. As so often happens, new documents bring me new information and create even more questions that need to be answered! Can any of my readers help with the Hodges family history?